A’ Design Award & Competition uses positive price discrimination to provide convenient entry for designers, artists, architects, start-ups and young talents in expense of higher entry fees for enterprises. However, Enterprises could too benefit from the low entry fees offered to professionals by supporting designers. Simply purchase any “Nomination Ticket for Professionals” and give it to a designer working at your company instead. Your designer will register and create an account for himself and nominate the design for his own name and write your company name to the “Client/Brand” section, as well as uploading your company profile and logo. This way, not your company, but your designer will be the official winner of the award, yet you will get all the benefits such as using the “Award Winner” logo on products or services. This method could also be used by agencies as well. This way you would be supporting your designers and meanwhile enjoying discounted entry. How to Share the Deliverables? If your designer wins the award, she/he should keep the trophy, but you can order a duplicate for your company. The designer will also get a certificate, which he should be keeping, likewise a duplicate could be ordered. All privileges of winning the award, including design ranking inclusion etc. shall belong to designer, however the Award Winner logo can be used by your company. The exhibition service will be provided complimentary for your product / service. Press release will mention both the designers’ name as well as the company name in most cases. Designer names shall be obvious. “X Company Design Team” is not a designers’ name; if you give nomination tickets to designers, their full names shall be used for PR purposes. Please note that your designers could also be a team, but if the team includes more than five (5) people, in this case it is considered the design department / R&R&D department and this entry method is not available. When registering teams, please remember to naming convention. 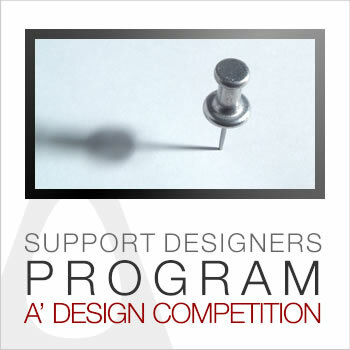 Simply, buy a "Nomination Ticket aimed at Design Professionals (Professional)" instead of "Enterprise", and when we send you the ticket code, forward to your designer so she/he can nominate a design under his/her name. This way you will be saving significantly from nomination fees.